This one goes out to all of those luscious summer tomatoes ripening on vines around the world. On a recent trip to a natural park in Jaén, a province in Northern Andalusia (read more here), I ordered pipirrana (not only delicious to eat, but also fun to say) every chance I got. Each version I had of this refreshing salad was a slightly different blend of the following base ingredients: ripe tomatoes, green peppers and hard-boiled egg in a garlicky olive oil vinaigrette. The result was akin to gazpacho, in salad form. I loved the blend of textures – the juiciness of the tomatoes, the crunchiness of the peppers — and the deep flavor of the dressing, perfect for dipping bread (my favorite way to clean the plate). Some versions were more soup-like than others, and the egg whites sometimes came grated and not diced, a nice decorative flourish (and a way to have a bit of egg in nearly every bite). One of my favorite versions, seasoned with cumin, was redolent of Andalusia’s Moorish past. In all cases, this quenching salad, typically served cold, provided delectable relief from midday heat. As is the case with many traditional Spanish recipes, there are likely as many variations of pipirrana as there are cooks, some more complicated than others. An entirely different pipirrana, with roasted peppers and salt cod, can be found in the region of Murcia. 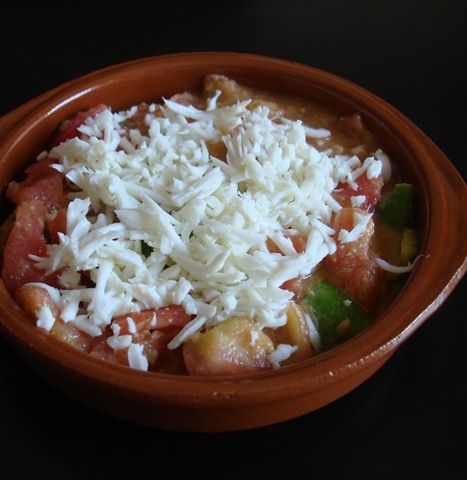 The following recipe is based on what I remember from the salads I had in Andalusia; several pipirrana recipes on Spanish websites; and Janet Mendel’s version in her book, Traditional Spanish Cooking. I have chosen a simple version, which makes for a quick and easy addition to any summer meal. The olive oil from Jaén (where about 70% of Spanish olives are produced) tends to be fruity and assertive, so be sure to use a flavorful extra virgin olive oil in this recipe. Pipirrana can be served as a side dish or fortified with canned tuna or sliced cured ham to make a light meal. Combine the tomatoes and green peppers in a medium bowl. Dice the white from the hard-boiled egg (1/8 inch pieces) and add to the vegetables. For the dressing: Pound the garlic with 1/4 teaspoon salt in a mortar and pestle, forming a paste (or put the garlic through a press). Add the yolk from the hard-boiled egg and mash to blend. Combine the garlic, yolk and vinegar in a small bowl, then whisk in the olive oil, adding it in a steady stream. The dressing will be thick and smooth. Taste for salt, and add more vinegar for balance if needed. Pour the dressing over the tomatoes, green peppers and egg whites, and toss well. If you like, garnish with additional ingredients: tuna, ham, olives… (see variations below). Top off the salad with 1 (5-ounce) can tuna, packed in water or olive oil, drained. Toss in 1/2 cup flavorful olives (green or black), such as Arbequina, Picholine or Niçoise, either pitted and chopped or whole. For a more seasoned vinaigrette, add 1/8 teaspoon ground cumin, blending it into the garlic-salt paste before adding the yolk.